When it comes to cleaning your bathroom your sink needs to shine, the tub needs to tidy and the throne gets the royal treatment. But there are some items in the bathroom that are often overlooked and could be harbouring nasty bugs. There are three hotspots you could be missing during your weekly once-over bathroom cleaning. Here you will find the majority of tricky places where germs grow and how to handle them to ensure the safety of your family and household. Germs are microorganisms which can be found everywhere around us. Most germs can cause diseases and make us sick. Being sneaky as they are, the germs can occupy people, animals and plants. Germs are divided into 4 sub-groups: bacteria, fungi, viruses and protozoa. bacteria – they are one-celled microorganisms that feed with their environment. viruses – organisms which have to be inside living cells in order to live and grow. It is good that viruses do not last long. fungi – made of more than one cell, fungi are plant-like organisms. What differs them from plants is their incapability to make their own food from water, air, and soil. Still, they get their food from people, plants and animals. protozoa – organisms made of just one cell which are keen on moisture and can spread diseases from contaminated water. Some of them can cause nausea, belly pain, and even a diarrhea. Did you know that your shower curtain is actually crawling with germs? I’m going to share some tips to keep it cleaner. While it can be both a very effective water barrier and a lovely decorative accent it can also be a home to a ton of germs thanks to the constantly damped conditions. Ever wondered what that pink slimy film on your shower curtain is? It’s actually caused by the bacteriam serratia marcescens, which loves to feed on the phosphorus and fatty substances from your soap, conditioner and shampoo. There are some things you can do to keep your shower curtain clean, or at least cleaner. First thing first, use a liner. They are very inexpensive, you can wash them easily, but you can also replace them frequently, it’s a lot cheaper than replacing a decorative shower curtain. You want to opt for nylon instead of vinyl, studies actually show that bacteria grow more slowly on a nylon liner. Another great tip, spread your curtain out after use – remember that the more folds there are, the more places germs can hide. Final tip, wash your shower curtain frequently according to the label instructions. You should use the hottest water possible, add a little vinegar and throw in a couple of towels for some scrubbing power. Learn more about limescale and how to tackle it. Showerhead. Source: wikimedia.org. User under CC BY-SA 3.0 license. The next forgotten realm, your showerhead. This unsuspecting fixture is often overlooked when you’re cleaning your bathroom, because it’s little over your head. Thanks to a lot of moisture it is the perfect breeding realm for a ton of microbes that like to set up shop there and then are spread in to the air, and all over you, every time your turn it on. The idea of a bacterial burst hitting your skin every morning doesn’t exactly start your day off right, however, most of those microbes are harmless. In 2009 though The University of Colorado discovered that 30% of showerheads contain something called Mycobacterium avium, which can actually cause respiratory illness to people with compromised immune systems. 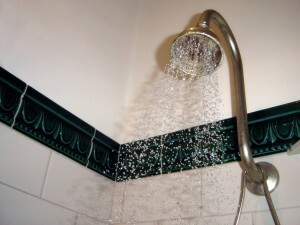 One of the best way to avoid the yuck factor is to let your shower run for 15 to 20 seconds before getting in. The other thing you should be doing, at least once a month, is giving your showerhead a bath. Detach it and place it in a solution of half water and half water. You can use an old toothbrush to help give it a really good scrub. If you find the above tips to work for you, you can check these DIY end of tenancy cleaning tips which are sufficient to keep your place in a neat condition. Researchers at The University of Manchester discovered that one uncovered toothbrush could contain more than 10 million bacteria, viruses and fungi. These include the likes of staphylococci, streptococcus and E. coli all of which have the potential to make you sick. 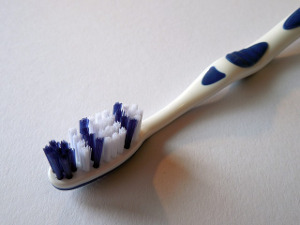 A couple of tips for keeping your toothbrush a little less grimy. Number one is replace it frequently, at least once every three months, if not monthly. Next tip is to store your toothbrush separately not with those of other family members, that’s a great way for germs to spread. In addition you should dry it before storing and store it upright so its staying dry throughout the day. It’s also ideal if you can store it outside your bathroom where there are a ton of germs. A great spot is your bedside table. The last tip, once a week give your toothbrush a bath in a little antiseptic mouthwash. Some bathrooms need more scrubbing and cleaning, and tackling only these 3 spots won’t be sufficient. We at Go Cleaners, always pay special attention to the bathroom area during before and after tenancy cleaning services. There you have it. Three germ hotspots in your bathroom that absolutely need your attention.